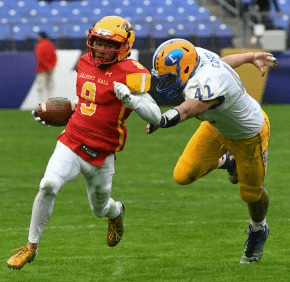 Calvert Hall sped to a 19-0 lead in the first 20 minutes and a 33-7 bulge midway through the third quarter, as it cruised to a 40-21 victory over Loyola Blakefield in the 97th Turkey Bowl at M&T Bank Stadium in Baltimore Nov. 24. Senior quarterback Ben Brooks threw for 204 yards and a touchdown, and had a pair of 1-yard touchdown runs. His favorite target was junior Chris Cooper, who netted 100 of his total yards on two scores, one a pass, the other a run. The Thanksgiving Day football tradition is believed to be the nation’s oldest uninterrupted rivalry among Catholic high schools. The Dons lead the series with 50 wins compared to 39 for the Cardinals, but it was the latter’s third straight victory and seventh in the last eight meetings. Just as they did last year, coach Donald Davis’s Calvert Hall team posted a long touchdown play in the opening minutes. Unlike last year, when that was the only score in the game, the Cardinals kept piling up points, as they scored on their second play from scrimmage in each half. Their second snap of the game was a 57-yard touchdown pass from Brooks to Cooper. On the Cardinals’ third possession, Brooks culminated a 75-yard drive with a sneak from the Dons’ 1-yard line. Calvert Hall got great field position on its fourth possession, with Tim Smith’s 1-yard run capping a nine-play, 35-yard touchdown drive. On the second play of the third quarter, Cooper ran 43 yards for a touchdown. On their next possession, a Brooks-to-Cooper completion was the big play in a seven-play, 47-yard drive that ended with another sneak by Brooks. 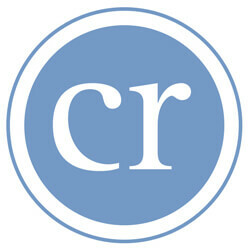 “I’m so happy to do this with my teammates,” Cooper said. Loyola Blakefield quarterback Will Koras threw a 5-yard touchdown pass to Kenny Lewis with 3:02 left in the first half, and got the Dons’ second score on a short run. The Cardinals finished with a 7-5 overall record, 2-4 in the Maryland Interscholastic Athletic Association A Conference, where St. Frances Academy and Archbishop Spalding went 1-2. Playing their final game for coach Brant Hall, the Dons finished 5-6, 0-6 in the A Conference. For more photos or to order prints, visit our Smugmug page here.